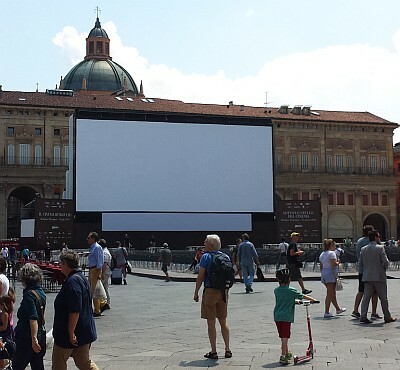 The outdoor screen at the Piazza Maggiore. It is much larger than it looks in this photo! This year I finally had the opportunity to attend–and participate in–the annual Il Cinema Ritrovato film festival in Bologna, Italy. Hosted by the Cineteca di Bologna, the festival features a truly global range of newly restored films, retrospectives and curated glimpses into forgotten avenues of film history. Screenings take place in the Cineteca’s screening rooms and the nearby Arlecchino and Jolly cinemas, to say nothing of nightly public screenings on the city’s main square, the Piazza Maggiore. Attendees at the festival regularly include film archivists and historians, distributors, critics and journalists. Thanks to the festival’s congenial atmosphere, it offers excellent networking opportunities for people working in those areas. One of the festival’s most important roles is to showcase film restoration work. In that regard, the great revelation for me was Murnau Stiftung and Cineteca di Bologna’s latest digital restoration of Robert Wiene’s Expressionist classic The Cabinet of Dr. Caligari (1920), which used the surviving camera negative extensively. It truly brought out the beauty and craftsmanship of the film’s cinematography—not always apparent in previously available versions—to say nothing of many subtle facial expressions in the performances. For me, even the film’s notorious painted sets revealed a stylistic variety that I hadn’t appreciated before; Wiene’s film in fact functions partly as an homage to modernist painting circa 1920. During one of the festival’s numerous educational programs, Anke Wilkening from the Murnau Stiftung outlined the film’s complex restoration history and discussed the methodology behind this latest attempt. Other restoration highlights included Raymond Bernard’s classic antiwar film Wooden Crosses (1932), Vittorio De Sica’s Marriage Italian Style (1964) and King Hu’s Dragon Inn (1967). Roundtables and lectures on restoration included Ned Price (Warner Brothers), Grover Crisp (Columbia) and Schawn Belston (20th Century Fox). 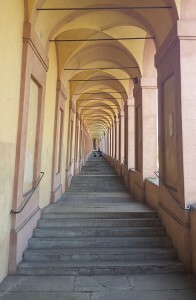 It is worth taking extra time to explore the city of Bologna, a fascinating destination in its own right. The city center is based on a medieval walled city, and although it was heavily bombed during World War II, a large number of original structures still remain. For me one of the most fascinating places was the Basilica di Santo Stefano complex, parts of which back to the 5th century. 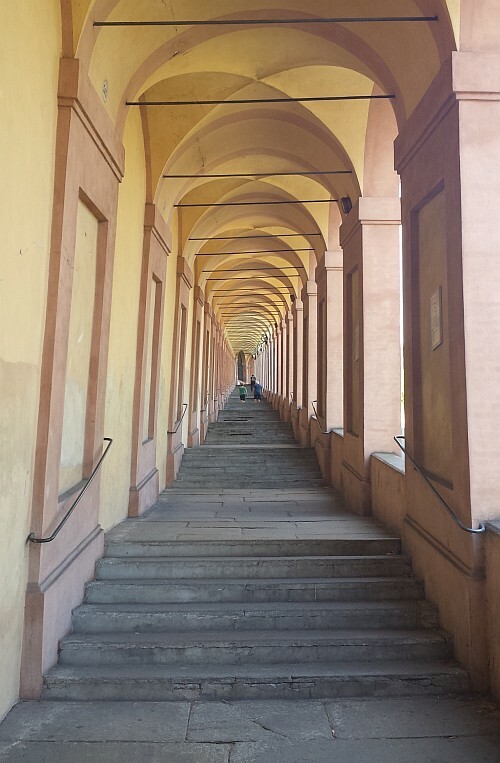 If you are in good physical condition, I recommend following the very long arched walkway from the Porta di Saragozza up to the Sanctuary of the Madonna di San Luca. The city is also home to one of the world’s oldest universities and benefits from a thriving student culture and progressive political outlook; its annual LGBT pride parade and festival took place at the same time as Il Cinema Ritrovato. And of course Bologna is known for outstanding food, including hand-rolled pasta and many varieties of hams and salamis. Perhaps what I enjoyed most was the presence of so many people out on the street socializing, even late at night. The Italians know how to live.